Help, My Hair Is Shedding! I have a contact me page on this site, a comment section below each post, a contact me page, and also very active social media accounts. Often, I'm asked questions of people searching for answers to pressing hair matters. I get a lot of questions that pertain to the same problem, so I thought I'd start answering some on video. My hope is that by me helping someone, it just might help you also. Below, I give advice to a young lady having a time with excessive shedding. If you have any questions about hair, products, or tools please feel free to ask me. I visited The Belgravia Centre in London and was told that I have central centrifugal cicatricaial alopecia. I was given treatment such as minoxidil to put in my scalp morning and evening and a hair laser to use on the scalp every other day. I also have the shampoo and conditioner which I still use. I did notice the hair coming back but as it’s quite costly I was unable to maintain it. I also use the essential oils with aloe Vera as a treatment before I shampoo which I learnt from you. I have never abused my hair, I don’t have dandruff, it itches and feel like a burning sensation, however I did relax it for 16 years and stopped in 2003. My hair is fine and soft, but thinning in the middle very slowly. Could you recommend any vitamins for my hair. I don’t want to spend more money where it will not benefit my hair. Just need some direction. Thanks Gina ? Hi Gina, sorry it has taken me a while to respond to you. 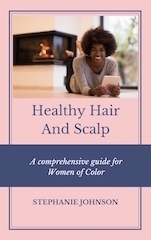 I have been working on a program for women with thinning hair problems which will be available very soon. It sounds like the problem you are having will not be an instant fix. You can try using a multivitamin for women on a daily basis, that might help. It’s going to take a little education and knowing your own body. If you don’t mind, I will add you to my email list so that you may have the option of checking out my program as soon as it is available. I wish I could give you a clear-cut answer, but that would be irresponsible. In the meantime, hopefully, the multivitamin will help.